Welcome back foodies and a Happy New Year! 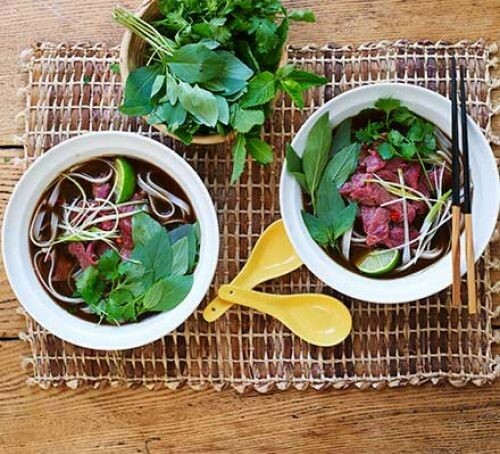 We have been busy in the kitchen this week and have a great recipe for you – delicious Beef Pho. Perfect for those cold and dark January evenings. We are all about creating healthy and nutritious meals, using high quality ingredients, so this recipe won’t disappoint. It’s full of delicious flavour and great ingredients, to develop into a yummy bowl of goodness! Place the beef bones in a large stock pot, then add enough cold water to cover by 5cm. Bring the mixture to a boil over high heat and cook for 10 minutes to blanch the bones and remove any impurities. Place a rack directly over a gas burner. Meanwhile, blacken the garlic, ginger & onions over the flame and add to the stockpot with the bones. Meanwhile, toast the cassia, cloves, peppercorns, and star anise in a dry frying pan over medium-high heat, shaking the pan occasionally, until the spices have begun to darken and become extremely fragrant, about 5 minutes. Add to the stockpot. Season the brisket with salt and add it to the stockpot. Using tongs, remove the brisket and allow to cool. Continue to simmer the broth to get as much flavour out of the bones as possible, 3-4 hours more. Remove and discard the bones and aromatics. Slowly strain the broth through a fine mesh strainer set over a large pot. Skim and discard the fat from the broth, then stir in the fish sauce. Very thinly slice the raw sirloin steak against the grain. Divide the noodles among 8-10 large bowls, then top with the brisket and raw steak. Ladle the hot broth over the noodles and meat and serve immediately with all the accoutrements. Hope you enjoy this dish. If you make it, we’d love to hear how you got on! And if there’s anything you’d like our Culinary Chefs to create we would love to hear your thoughts.